The text-format of Prairie Dog Song written in collaboration with Cindy Trumbore (see Parrots Over Puerto Rico and The Mangrove Tree) was inspired by an old Irish folksong. 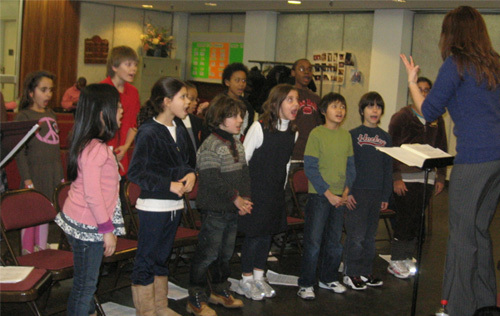 Cindy's daughter, composer Dale Trumbore, created a choral arrangement also inspired by the original song. She recorded it with a children's choir available at leeandlow.com. Her original score is included at the end of the book so that readers can sing the text as well as read it. 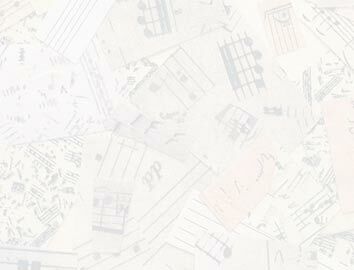 Composer Victoria Bond's new opera, MIRACLE! (libretto by me), which was commissioned by the Young Peoples' Chorus of New York City. My friend, the composer Victoria Bond, wrote music designed to be performed together with a slide show of my illustrations from my book, Nothing But Miracles, written by Walt Whitman. The world premiere took place in Baltimore, Maryland, in May, 2004. 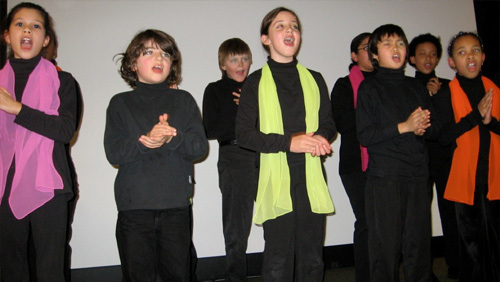 Fifty-five young boys from the Gilman School performed the piece which was the focal point of the annual Spring celebration there. This amazing event could only have happened with the dedicated participation of many people at the Gilman school, most especially by my friend, librarian Cindy Woodruff, who coordinated the event which included collage workshops presented by me, and an exhibit of my original art work from Nothing But Miracles in the Gilman School Gallery. Pietro Ciabatti, and the Piccoli Cantori del Convitto. Arezzo, Italy December 16, 2006. Victoria Bond and I collaborated again with a similar project which centered on my book Do Re Mi. 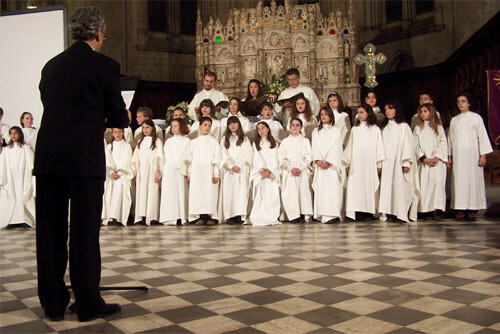 Angelo Mafucci, who is maestro of the children's choir of Arezzo, Italy, taught the children the music and conducted the world premiere which took place in the Cathedral of Arezzo on December 16, 2006. Click here for the story of this historic event in Publishers Weekly, written by Alexis Burling. director of the Convitto Nazionale Vittorio Emanuele II. We are planning an art show of all the original art from Do Re Mi to be held in Arezzo. 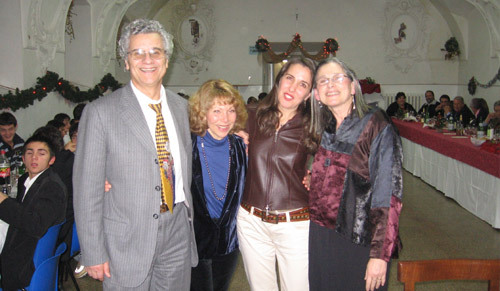 At the invitation of Stephanie Borgman, Chair of the Children’s Round Table of the Texas Library Association, The North American Premiere of the Guido d'Arezzo Oratorio was presented in San Antonio at the convention on April 14, 2007. Karen Sieffert conducted the All-state Choir and soloists. Victoria Bond, Nancy Patz and I created a commissioned piece for Babies Can’t Eat Kimchee!, which was premiered at GreenMount School, Baltimore, MD in 2008. 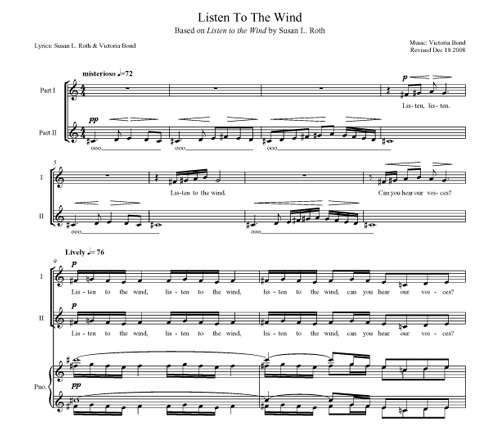 Listen to the Wind, a song by Victoria Bond, with words by both of us, had its World Premiere on January 22, 2009, at Barnes and Noble, Lincoln Center, New York City.